Matches my kitchen faucet and 33 inch farmhouse sink, love it!! Get just the look and deep dark finish you want. Beautiful oil rubbed bronze with brushed finish disposal drain for use with sinks that have garbage disposals. This drain has and extra long flange that allows it to be used with sinks that have a garbage disposal. 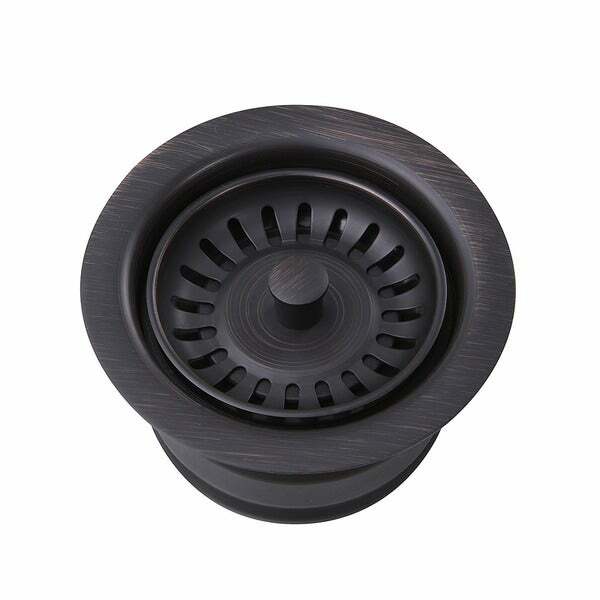 The oil rubbed bronze flange and strainer will give just the right touch you're looking for. All the functionality and the reach that you need to complete the look of your sink. Designed For Thicker Sinks Such As Fireclay or Stone Farmhouse Sinks. This Oil Rubbed Bronze disposal drain looks absolutely breathtaking in my Apron sink. If you have Oil Rubbed Bronze fixtures in your house, this will go very well with them. The color is true to the description. We bought this to fit our White Italian Fireclay 30-inch Farmhouse Kitchen Sink by Highpoint Collection and couldn't be happier with it. Its finish matches all of our other oil-rubbed bronze fixtures. It seems to be of high quality and adequately does the job it is supposed to do. Would purchase again. We haven’t installed our farmhouse sink yet so we haven’t installed the disposal drain but I set it in the sink while still in the box and the bronze finish looks great up against the white sink. I would repurchase this drain again. This was a beautiful drain but I could not use it as the thread pattern was wrong for my disposal. Not sure how you would check it to be honest. I also realized the sink I purchased (from Overstock and love) came with a stainless grid for the sink, so the oil rubbed bronze would have looked odd anyway. 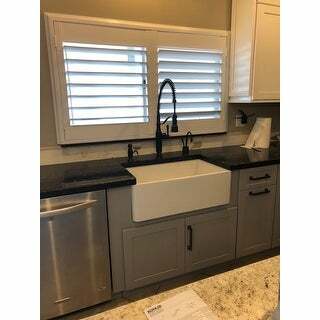 Can’t wait to see my new drain collar installed in my new bright white farmhouse sink, both purchased from Overstock along with my Brushed oil rubbed bronze faucet. It arrived today and is such a beautiful ring to put in my sink. Brings out all the bronze in the kitchen. Can’t wait only ten more days til Demo Day! The drain match’s perfectly for our oil rubbed bronze faucet and our farm sink. It’s a beautiful finish. It shipped quickly and was super easy to install, fitting the standard size drain. Bought this for our Olde London Farmhouse Sink. Installation was no problem. The oil rubbed bronze finish is a perfect match to other rubbed bronze finishes in the kitchen. This item on Overstock was a lot less expensive that from local plumbing fixture stores. Works excellent, does the job. No staining, discoloration or anything else! The oil rubbed bronze has a very nice finish to it and pairs well with the "Fontaine Oil Rubbed Bronze Modern European Residential Spring Kitchen Faucet" for a wonderful look. Could not be happier with the new oil rubbed bronze drain we ordered for our new farm sink! The finish is beautiful and complements the new faucet perfectly! Was beautiful upon installation...have had it in use for several months now and the finish is wearing off. I don't even use abrasive cleanser. So disappointed. I was looking for an extended collar drain as dark as possible to match my black faucet. This is not only very dark (almost close to black), beautiful and great quality. Exactly the color we were looking for! I know it is going to look great with our highpoint collection Fireclay farmhouse sink! The perfect combination! Shipped wrong color and charged me *** for their incompetence. Just what I needed to finish out my Highpoint Collection farmhouse sink. Perfect condition and I paid for overnight shipping, which was very efficient. Great! "Will this work for a Sink master 750 garbage disposal? " My first instinct was to say that it should work with any standard disposal. The only difference in this one is that it has a deep collar. However, I just read one review that said it did not fit with her disposal. I don't know what brand her disposal was. "Can you use it for sinks without garbage disposal? My sink is very thick." You should be able to. It might just be weird because there will be a big opening in the bottom of the sink where normally food would go into the disposal. With out a disposal the water would just run into the flange/fitting underneath and then connect to the drain pipe. If you drop something down it, depending on the size of the object, it would go down the pipe, where otherwise, it would drop into the disposal and you could reach in and get it out. I don't think it is intended to be used without the disposal. Unfortunately, this drain only works with garbage disposals.